You can get so much versatility from this top. 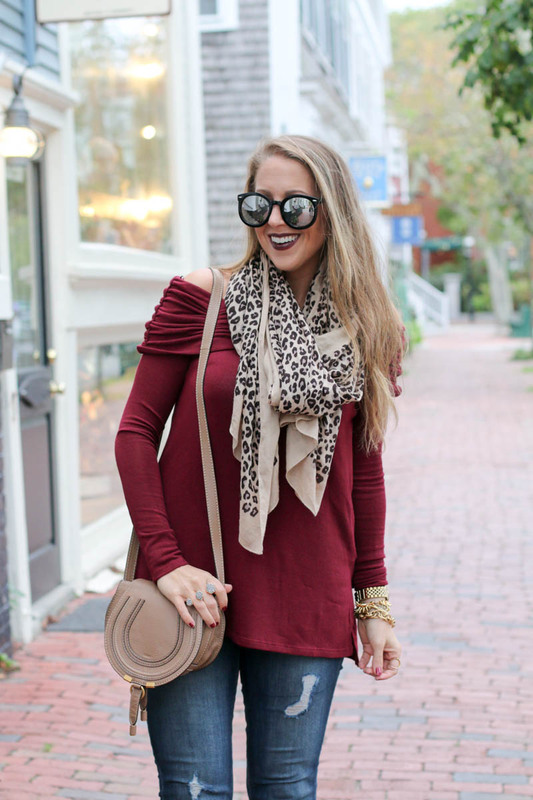 Not only do you have the option to wear it both off the shoulder & as a slouchy cowl neck, but it looks great all by itself or layered. Since they brought it back and it’s now in some great new colors I’ll be picking up a couple more for this season since I got so much wear out of it last year. Goes great with leggings too! 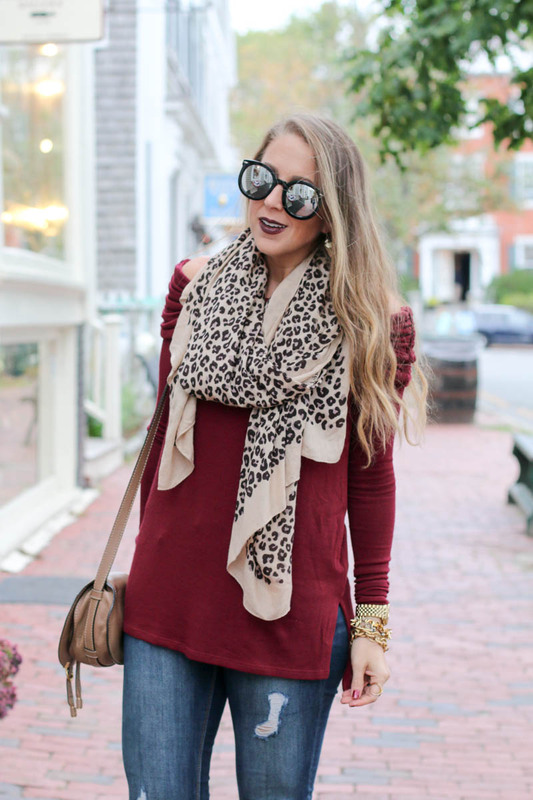 The leopard scarf speaks for itself. You need it. It’s $19, ships free, and is perfect. Grab it here. I always talk about Karen Walker Sunglasses because they are the bomb. Shop these and all the other sunnies she has to offer here. 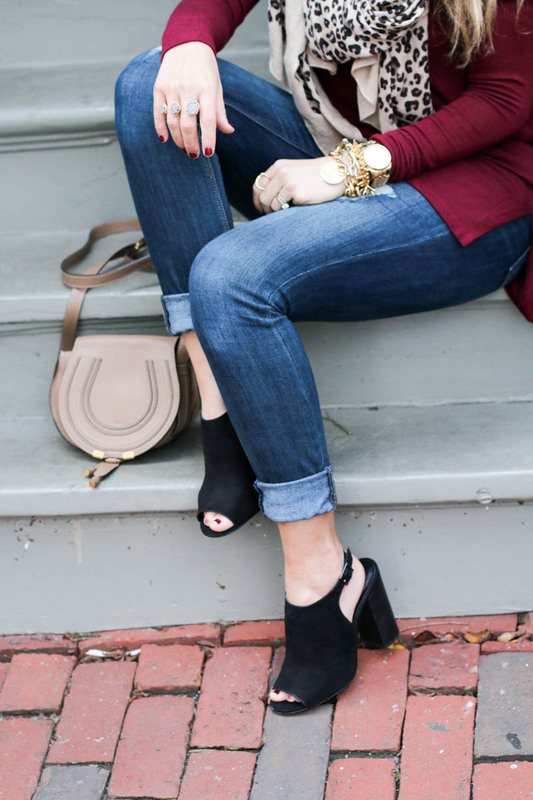 Every piece of clothing that I’m wearing (& the booties!) are under $100 & ship free. 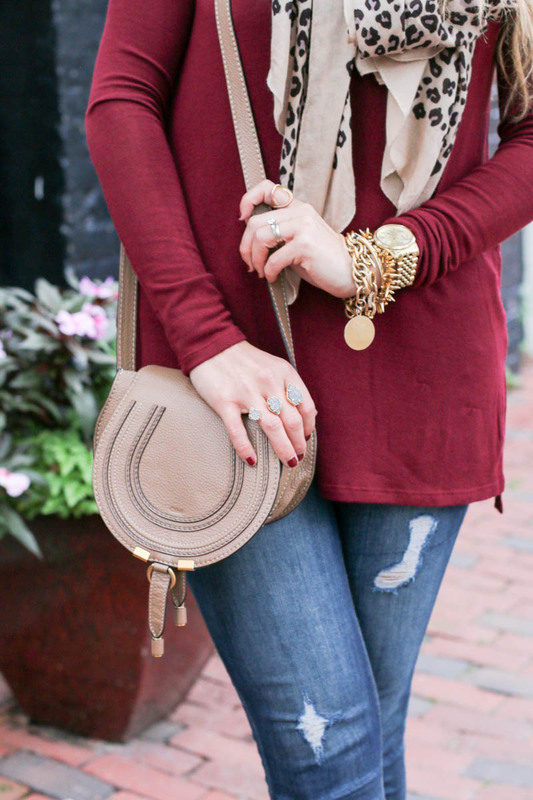 All fall staples. All you need in your closet. 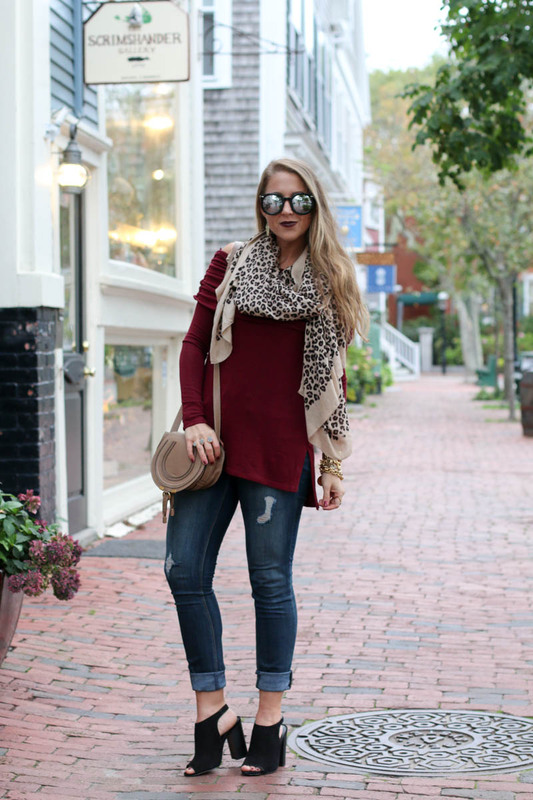 See some other blasts from the past of how I styled a couple different scarves in this post & this post. I was going to share some old leopard posts too but they are SO BAD! Okay… I’ll show you one. Talk about an oldie & from my first year blogging when I was taking my pictures with a tripod & remote. See it here. I’ve still got a long ways to go with blogging, but gosh have I come a lot further than when I started 3 years ago (just had my 3 year anniversary last month!). Kinda crazy to look back at old posts & just cringe at the quality. But…we all have to start somewhere, right?! Remember that. We all start from scratch, and although it’s kinda embarrassing to look back at my first year+ of blogging it goes to show that if you love something you’ll make it work. A tripod & remote folks. I can’t tell you how many times I’d be standing in the road (where people were not driving), and dog walkers or bikers would come by & look at me like I was crazy. My response was always “I’m a blogger & my husband’s deployed so I have to take my own photos!” Point of all this is that if you want something enough you’ll do anything to make it work. Never let anyone tell you that you can’t do something, because you CAN! Go enjoy your first full week of October, and know that I think you’re fabulous!